Berlin, September 14, 2017- We are pleased to announce that the Medienanstalt Berlin- Brandenburg has granted the license to the frequency 104,1 FM to KCRW Berlin. KCRW Berlin is a locally operated English language community radio station affiliated with KCRW, US public radio’s flagship station for Southern California. KCRW Berlin represents cutting edge US public radio with an eclectic mix of independent music, news, talk and arts programming. Broadcasts will include locally produced content reflecting the spirit of Berlin, NPR news shows, as well as shows produced by KCRW and other public radio entities in the United States. Community events will also feature strongly in KCRW Berlin’s activities, from annual holiday events to Town Halls and panel discussions. 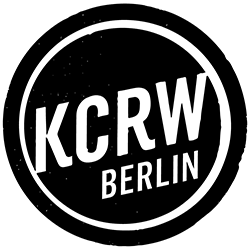 As KCRW’s first international partner, KCRW Berlin provides a unique platform for cultural exchange and leveraging the 50-year Sister City relationship between Berlin and Los Angeles. Weekly current affairs show on topics of local interest. To find out more about our upcoming events and programs listen to us, beginning October 1, 2017 on 104.1 FM. Be sure to tune in!